Image features Newer "Steelhead Plus" Model 3 wood. Bought the 3+ used because I didn’t have a fairway metal I felt comfortable with hitting off the deck. Saw this at a used club dealer and decided to give it a try. Initially thought I would use it off the tee but struggle with it from the tee. From The fairway or rough I love the club. Makes a sound that I really enjoy when I hit it solid. Comes out low and hot. Great workability from left to right. Never have been able to get it to turn over for a draw tho. Majority of my shots have just a slight fade. Misses are typically just a straight left miss when I play a fade and hit it straight where I aim. Overall very happy with the consistency of the contact, ball flight and distance. For me the only drawback is that I have never been able to consistently hit off the tee. I purchased a different 3 wood that I use off the tee when needed. I only carry a driver and my 2 different 3 woods other than my irons and wedges. Hands down the best fwy metal ever produced. I hit it 280 off the tee and is an awesome option off the tee and is especially good on tight, but shorter, par 4's. From the fairway, it just goes and I can work it around dog legs and trees without a problem. The issue with woods today is they are too long from heel to toe and you can't work the ball like I can with this one. Original Callaway Great Big Bertha Titanium 10 degree. No longer in bag. I owned this club shortly after it first came out about ten years ago. After using both the firm and regular flex RCH 99 graphite shafted models, I sold both clubs and tried other fairway woods. Originally I had a tendency to hook this club, but now that I've gotten older, I'm back to the Steelhead with the RCH 99 regular flex. The main advantages to this club are the weighted sole and the moderately sized head. I have recently hit a number of good shots with this club out of questionable lies. It is also very effective off the tee on tight driving holes. I've been very pleased with its performance. It seems difficult to find a three wood that is good from both the tee and the fairway. This club fits the bill for me. I also got it for less than $25 shipped on ebay. The price was hard to beat. However, I think that a younger, stronger player would prefer a more current model to this one. I wrote a review about these when I first got them a few years ago now I have more experience with them I’m returning with this amendment. 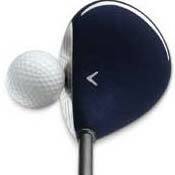 These are very nice woods they look good sound great and sit well behind the ball. Trajectory is good and they are pretty easy to hit off the deck. Now the part of my review I would change the forgiveness there is some but not as much as I would like. The heads are small and although you can get decent results from toe or heal strikes you will lose distance and suffer for your error. I can see that a low handicapper would enjoy a small headed FW that sits naturally and can be worked both ways. As a higher handicapper I want more forgiveness and a touch of draw bias would come in handy when hitting a four wood from the deck. The Callaway original steelhead is by far the best fairway wood I have ever hit. The weighting and balance are perfect and unlike new fairway woods, this club has excellent feel. You can practically feel the ball compress. This club will be in my bag for a long time as it's difficult to find clubs with square face angles anymore. I'm sick of companies building in left biases to all their clubs. Keep the center of gravity in the middle of the face, which is where we all are trying to hit the ball in the first place!! My other two choices were Titleist 980F and the 904f. The Titleist clubs also felt great, I prefered the 980F, but the original steelhead was more forgiving. Haven't had to use them. I loved this club i bought it used from my local pro shop. Its not massive like every other fairway wood. its a nice size. This club is ridiculously long. I might not recommend to higher handicappers as it is not very forgiving. However, I play a nice strong draw with this and hit it about 260 off the tee, which is remarkable considering my driver only goes about an average of 275. But I've got an r7 460 on the way that will hopefully remedy that. The grafalloy prolite shaft is amazing and I've tried a few other 3 woods on the launch monitor since buying this, but nothing even compares. It's easy to work the ball where you want, and it goes where you point it 95% of the time. I've had this club in my bag for about a year and a half now and it is not coming out anytime soon. This is a great value for a sub-12 handicapper. I have owned this club for about 6 years and took it out of my bag 3 years ago so I could add another wedge to my bag. I kept my 3 iron in my bag and that was a mistake. This 5 wood has a consistant launch and trajectory and I hit it about 240 yards on a full shot. I use off the tee on short or very thight par 4s. The face is closed about 1.5 degrees and I have the stock R-flex steel shaft in it. Over swinging this club will produce a low hook every time. My scores prior to putting this club back in my bag were in the 91-97 range. Now that I am in the fairway 5 more times per 18 holes I am shooting in the 81-84 range. Take your 3 iron out and put this "outdated" club in your bag and lower your scores.